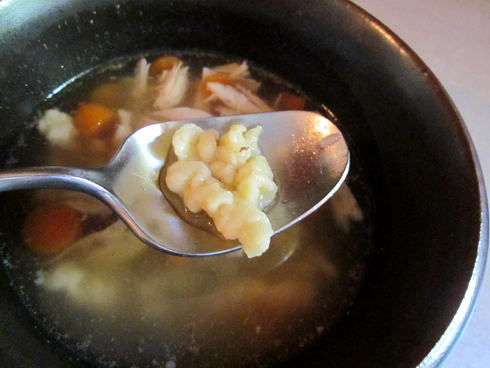 Chicken soup is always a big hit at our house. Sophie especially loves it when I make homemade noodles and add them to the soup. I’m happy to make it for her, but it can be kind of messy and a bit labor intensive. A few weeks ago, I picked up a Spaetzle Maker hoping that it might be a little easier than making homemade noodles. Before we get to the recipe, I should explain spaetzle. To start, spaetzle is pronounced in a few different ways. Some say “SPAT-zle”, at our house it is “SCHPET-zle”, and when my grandma talks about them she simply calls them as “nep” – as in, “grandma used to make us eat liver nep soup”. Basically, they are little German dumplings. 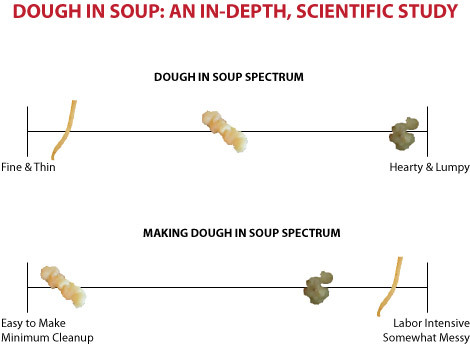 On the DOUGH IN SOUP SPECTRUM, they land somewhere between a dumpling and a noodle. On the MAKING DOUGH IN SOUP SPECTRUM, they are the easiest and require little cleanup. Making spaetzle is easy, as long as you have a spaetzle maker. It looks much like a grater with a box on one side where the dough is held. It balances on the top of a pot of boiling water or broth, and you quickly grate the dough over the pot and they drop in to cook. Spaetzle makers are not very expensive, don’t take up much space, and while you can make spaetzle without one, this tool makes it fast and easy. Plus, with the tool you can ensure that they are uniform in size so they cook evenly and quickly. Onto the soup. I started with a whole chicken and cooked it down for about an hour. I use this same approach whenever I make a chicken-based soup. 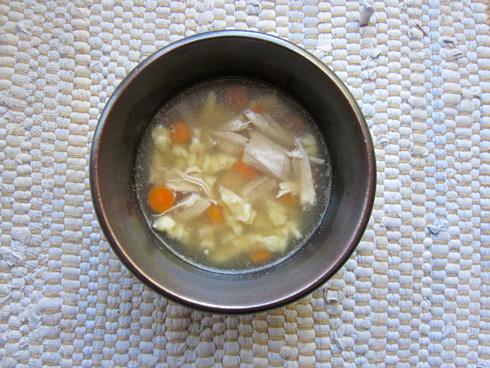 It makes a rich, flavorful broth plus cooks the chicken perfectly with very little effort. Overall, this soup was very easy to make and full of flavor, I’ll definitely make it again. It makes a very big batch, which means that we’ll have enough to eat this week plus some to freeze for later. In a large pot, heat oil over medium high heat. When oil is hot, add onion, celery and carrots and cook for 4-5 minutes, stirring occasionally. Add chicken and brown on all sides. Add water to cover. Bring to a boil, reduce heat to a low simmer and cook for one hour. Add water if needed to keep chicken covered. Remove chicken and set aside to cool slightly. Remove all of the solids from the pot and discard. Increase heat to high and bring stock to a boil. When chicken has cooled enough to touch, remove all of the skin and bones. Shred chicken into bite-sized bits and return to the pot. Add carrots to the pot, and return to a boil. In a bowl, beat eggs until they are foamy. Add half of the soy milk, flour and salt and combine. Add remaining soy milk, flour, and salt and combine. By hand, combine until the dough is elastic but not sticky. Add more flour or soy milk if needed. Using a spaetzle maker, drop spaetzle into the pot. Bring to a boil, reduce heat to a simmer. Cook for about 4-5 minutes or until carrots are tender.